About 3 years ago, I got a stack of wooden ovals that I knew had so much potential just waiting to be unleashed. The ovals are sink cut-outs from a job that my dad worked on so they are nice thick 3/4″ plywood. Brad and Keven threaten to burn these ovals each summer in the firepit but so far I have managed to keep them around. I’ve talked quite a bit about how the colors of our nursery are grey and white; however, I haven’t talked much about the fact that it also has a travel theme. Brad and I love to travel and I also really like maps and skylines so it was the perfect theme for our nursery. 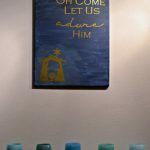 To create the ocean I used Minwax Express Stain in Indigo. In just a few minutes the oval was stained a nice deep blue. Simply use a paper towel to rub the stain into the wood and then remove the excess. Make sure to put some sort of drop cloth down so that you don’t stain the ground like I did. 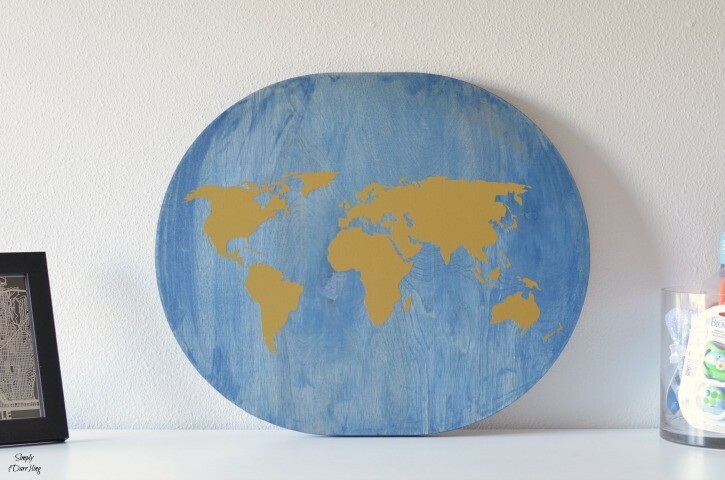 For the world map, I purchased a world outline shape and cut it out with my Silhouette Cameo using Gold Metallic Vinyl. 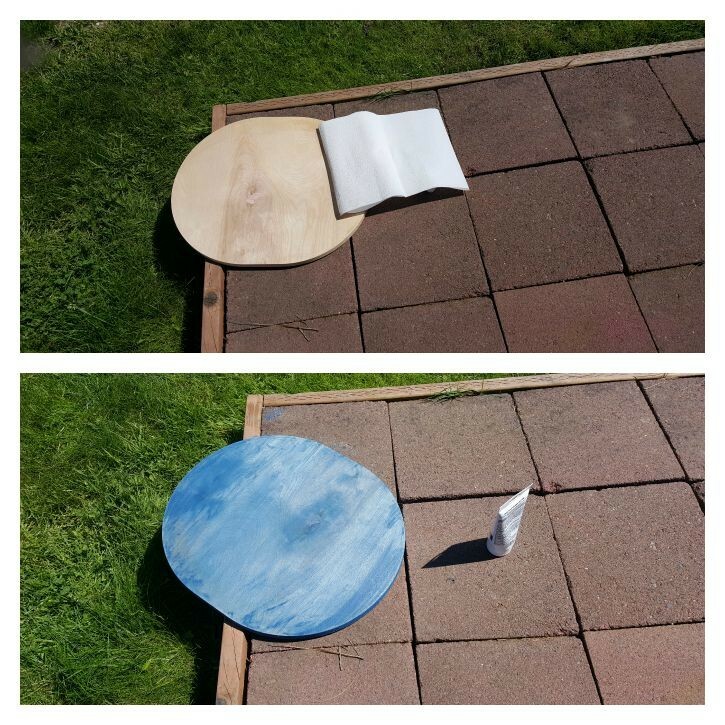 The ovals are about 17″ by 20″ so it was easy to size the world outline to fit. When cutting a design this large I recommend using the Silhouette Roll Feeder. The map fits perfectly into the room. 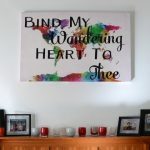 For now, it is sitting on top of the dresser but I have some artwork coming to hang above the dresser so I’ll be moving it to a different wall in the room. 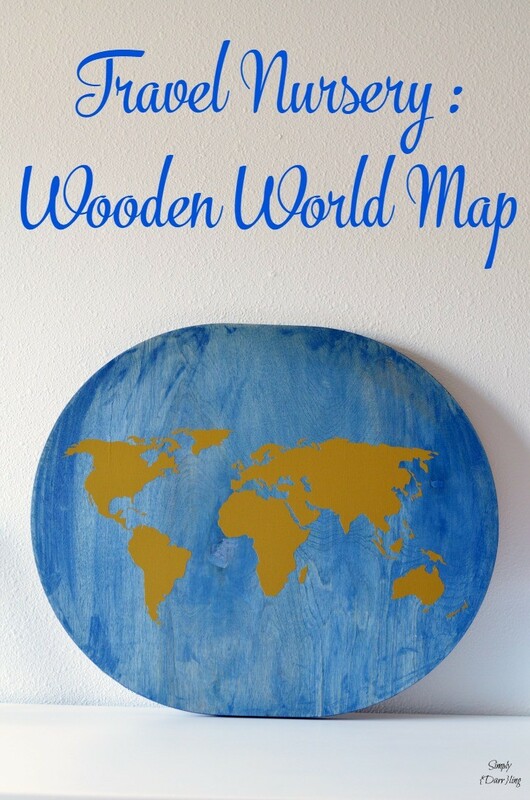 I absolutely love how this wooden map project turned out. I can’t wait to see how it fits into the final room. I still have about 30-40 of these ovals, what do you think I should do with them? Use the ovals for placemats for a holiday. Paint, stain, glitter, food safe varnish. This is so cute! Great idea!!! Oh my gosh that’s such a cute idea! My oldest had an ocean theme when he was little, one of those ovals would have made the perfect backdrop for a fish bowl or ocean scene. Love when you can repurpose random things into fabulous pieces! This is super cute and looks super fun to make! This is so cute! We’ve added a lot of travel decor to our home and this would fit right in with it. Great idea! I agree you could sell these in Etsy or other craft venue. You could take the world map and make a clock out of it as well. Such a cute idea. I love all of your nursery posts. Can’t wait to see the baby ones. So cute! I can’t wait to see it all. The best part is it is really easy to do! Thanks for sharing! I bet this would work well to let my little future astronaut make planets to decorate his room! Oh, how cute! 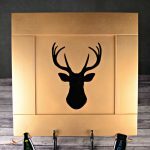 I love this, I need to make it for my dude’s room! With that many, you could open an Etsy shop and make more maps to help fund your adoption. I love this idea, how clever & unique! And the colours you chose are so nice!!! Brilliant, I love how you have fought to save these ovals form the fire too! I’m not sure you are going to need 30 of them unless you are going into business making these though! You could make more signs though, they’d make great gifts, you could do little hearts on the map for where people live or where they met for a wedding gift perhaps. 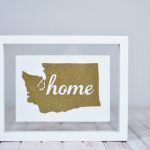 I don’t think you should rest until everyone you know has at least one oval wooden sign in their home! I absolutely LOVE this map!!! This is awesome! It would be great in any room of the house (which is great for me because we don’t have a nursery anymore). Sharing!! This is so darling! It inspires me to get out my Silhouette and use it more often! Thank you for sharing on Family Joy Blog Link-Up Party. We hope to see you again next week! Looks Pretty!! Thank you for sharing with us at #HomeMattersParty. We would love to see you again next week.